A Swiss, Albert Kaufmann working with the Scintilla Company, invented the jig saw blade. He tested the idea by trying it out by fixing a blade into his wife’s sewing machine then watching it cut. He could never have imagined the array of blades that would be produced from his basic idea. The Scintilla Company produced his first electric handheld jigsaw in 1947. The Scintilla Company was later taken over by the Bosch Corporation. Today Bosch is a leader in jigsaws and jigsaw blades worldwide. Tradesman and other professional woodworkers agree that the jigsaw is versatile, which make it a top choice of the power tool universally, especially when cutting a variety of different materials. This article will highlight the major jigsaw blade types that are important to today’s woodworker and carpenter. Both types have their pros and cons. The T-shank is a more versatile arrangement, since most jigsaws are able to accommodate both the T-shank AND the U-shank blades. Be aware that Bosch equipment for example, will only accommodate ONLY T-Shank blades. 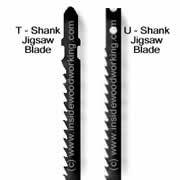 There is further details about why these two different jigsaw blade shanks evolved, found in this jigsaw review. Major jigsaw blade manufacturer like Bosch do make both types of blades. The U-Shank type porter cable jigsaw blades as well as T-shank type Makita jigsaw blades. In the following article we mostly show t-shank jigsaw blades from Bosch, with cat.no. starting with T... . Since Bosch does also manufacture universal U-shank jigsaw blades there cat.no. would be identical just replacing the T with an U at the beginning. 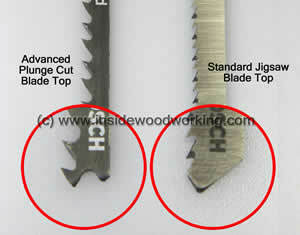 Example: Bosch jigsaw blade T101B is identical with blade U101B except for the shank. Woodworkers work with a vast array of wood from hardwoods to softwoods, and from plywood to particle boards such as the engineered MDF and OSB’s. Today the craftsman demands a wide variety of jigsaw blades. Looking at this world, with different requirements for ‘crosscut’ to ‘rip’ blades, scroll or circle cutting blades, and reverse cut blades, cabinet makers and woodworkers need to find the correct jigsaw blade for their application. The first distinct or important jigsaw blade has to do with its speed of cut. Look at the two Bosch jigsaw blades (seen next - Image shows the Bosch jigsaw blades numbers T244D and T101B) both cut wood. Side Set Teeth Blade used for high-speed rough cuts. The offset of the teeth prevents the jigsaw blade from being "squeezed" during the cut. Together with a high orbital action, the settings on the jigsaw guarantee a high rate of cut. Side set teeth jigsaw blades - with a wide teeth pitch - cut especially well along the grain. (seen next during a rip cut). 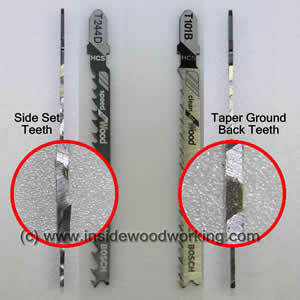 Taper Ground Back Teeth without any side set, the blade itself is tapered to the back. This blade will not overheat or become jammed. Taper ground jigsaw blades offer a very clean (almost splinter-free) cut. This type of blade cuts at a slower speed, and is commonly used in cabinet making when cutting plywood as well as hard and softwood. Width of the jigsaw blade. A smaller blade cuts curves more easily than a wider. Distance between center line and blade teeth top. The top of the jigsaw blade teeth are very close to the centerline of the blade. This allows you to turn the blade near the center of the jigsaw center line. Even the finest jigsaw blade causes some splinters along the top of the cut line. The orbital action of a jigsaw, which drives the blade in the up and down direction and driving any standard jigsaw blade will splinter on the up stroke (seen next Image shows the Bosch jigsaw blades number T101BF, and the reverse teeth Bosch jigsaw blade number T101BR). From time to time the craftsman requires special reverse teeth blades that will cut close and splinter-free along the top of the work. This is Important! Should you be using a reverse teeth jigsaw blade, the orbital action of your saw must be switched OFF. 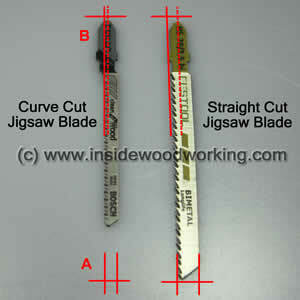 You will need to hold the saw firmly to counter surface and reverse the cutting direction manually. Woodworkers are sometimes required to make plunge cuts. Whether it’s ‘cut outs’ for kitchen sinks or insets for table tops, a quick plunge cut with a jigsaw is often handy. You know longer have to drill a hole for blade insertion. 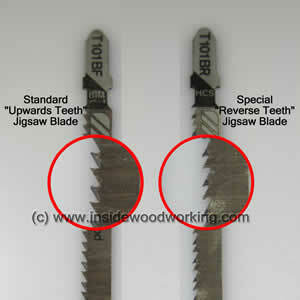 Modern jigsaw blades now have the capacity to directly "dive into" the work without any preparation. 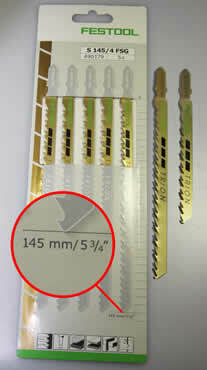 The photo next shows some more advanced jigsaw blades with special ‘plunge cut tops’ for less splintering. How deep a jigsaw will cut depends upon, the motor power, blade guidance and length, as well as your machines orbital action. Many blade manufacturers like Bosch, Dewalt or Festool sell long jigsaw blades for cuts up to 5 3/4" or 145mm. (seen next Image shows the Festool jigsaw blades numbers S74/4FS, S105/4 FSG and S145/4FSG). When examining long jigsaw blades, check the blade thickness and notice a wider side-set of teeth - than standard size blades. Extra jigsaw blade thickness on very long saw blades avoids bending, especially when cutting full depths. A wider side-set of the teeth prevents the blade from being squeezed and overheated, if you find it necessary to cut through green (non-cured) wood. This is the first part of our jigsaw blades review. The second part covers especially Bosch jigsaw blades for non-wooden material.